Friday, Feb 1, 2019, 3:30 – 5 p.m.
China’s diverse landscapes and its rich plant life have attracted the attention of travelers, western plant hunters and botanists for at least two millennia. While traveling through and observing the same mountains, plants and people, the records of what they saw reveal as much about changing meanings of the natural world as about the places they described. During the early decades of the twentieth century, the first generation of Chinese botanists published reports of their plant collecting expeditions in which they wrote about the pressing need for a ‘scientific accounting’ of the nation’s plants and environment, to be carried out by Chinese scientists, not westerners. They wrote vividly about the plants they collected not just as objects to be assigned the correct scientific name, but as markers of a wider, distinctly Chinese natural world. In this talk, I use some of these first hand accounts to reflect on how new scientific practices such as field research altered the writers’ experience of and response to the landscapes and people they encountered. 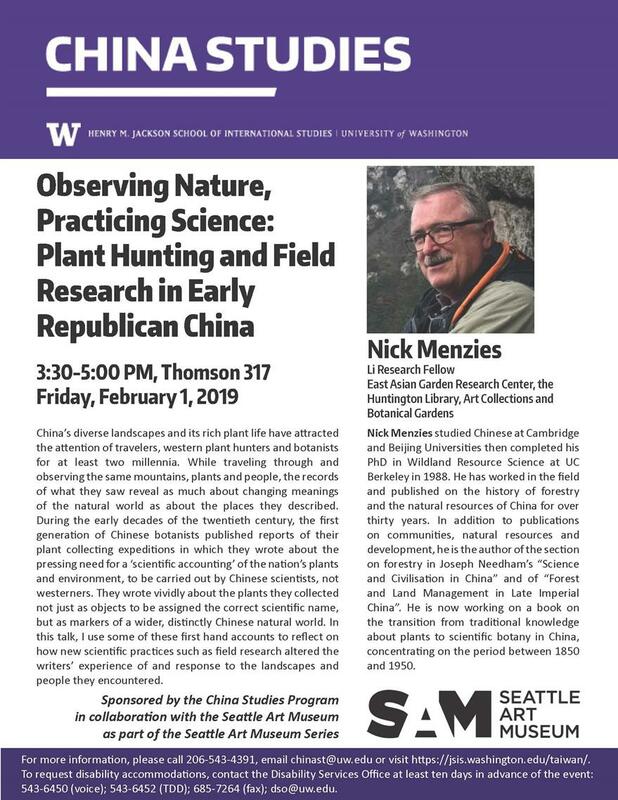 Nick Menzies studied Chinese at Cambridge and Beijing Universities then completed his PhD in Wildland Resource Science at UC Berkeley in 1988. He has worked in the field and published on the history of forestry and the natural resources of China for over thirty years. In addition to publications on communities, natural resources and development, he is the author of the section on forestry in Joseph Needham’s “Science and Civilisation in China” and of “Forest and Land Management in Late Imperial China”. He is now working on a book on the transition from traditional knowledge about plants to scientific botany in China, concentrating on the period between 1850 and 1950.